The 2013 Hurler of the Year scored a point with his first touch yesterday after coming back from injury. Tony Kelly proved popular after the game. 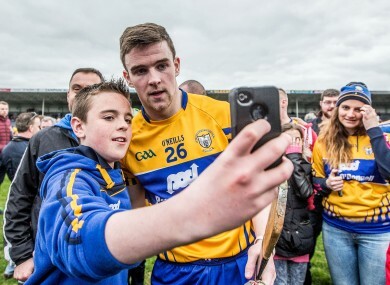 HE MAY HAVE only returned to hurling this week after suffering an ankle ligament injury in training back in January, but that didn’t stop Tony Kelly from getting involved almost immediately. The 2013 Hurler of the Year scored a point with his first touch and added another soon after to give Clare their biggest lead of the game before Davy Fitzgerald’s men secured a place in the Allianz Hurling League final with a 4-22 to 2-19 victory over Kilkenny. But while it was good for the 22-year-old to get a run out, he insists the most important aspect of yesterday’s outing was the final score. “I suppose on a personal level it’s great to be back hurling. “I’m just back hurling this week and it’s good to get out and get 20 minutes under the belt. Kelly admits that Clare haven’t been at their best since winning the 2013 All-Ireland in dramatic circumstances but the Ballyea forward is convinced they won’t be carrying that baggage into this year’s championship. “It’s a new year and it’s a fresh start. We didn’t perform to our level in the last year or two. “It’s about going out on the field and doing it on the field and putting that behind us. As for Waterford in the final, Kelly says that while winning a final would be a significant step for the Bannermen, the match probably won’t have any bearing on the gameplan when the two meet again in the Munster semi-final on 5 June. “I don’t think Clare have been in the final, let alone won one, for a number of years. We set our stall from the start of the year that every game we play we want to go out and win it, be it a challenge match or a league match or championship and the league is no different and we’ll be coming down to win it. “I suppose people might make a lot of it this week that we’re playing the same team in the space of maybe three or four weeks. “The league final is going to be completely different to what championship is. There’s no two games the same, no matter if you’re playing the same team. We’ll look forward to it, they’ll look forward to it as well. “It’s another game to see lads heading into championship as well which is always a plus. Email “'It’s good to get out and get 20 minutes under the belt' - Tony Kelly on his return to action”. Feedback on “'It’s good to get out and get 20 minutes under the belt' - Tony Kelly on his return to action”.